HOUSTON – Less than 24 hours before the space shuttle Discovery departs the International Space Station, the shuttle crew and the astronauts living onboard the space station joined together for a special farewell ceremony today (March 6) to commemorate the end of a successful joint mission, and to celebrate Discovery's final visit to the orbiting outpost. "It was a pleasure to be up here," shuttle commander Steve Lindsey said. "We appreciate your hospitality. On behalf of the crew, we had a great time. We're going to miss you guys." Station commander Scott Kelly also said a few words on behalf of his crew. "It was very successful time onboard with you guys," Kelly said. "We really enjoyed having guests – this is the first group of guests I've had in 150 days since I've been here. We're going to miss you." With Discovery set to undock from the space station early tomorrow morning, Kelly also spoke about the workhorse orbiter's legacy and the significance of its final time journeying to the International Space Station. "We're going to miss Discovery," Kelly said. "Discovery has been a great ship, and has really supported the International Space Station, more so than any other space shuttle, and we wish her fair winds and following seas." 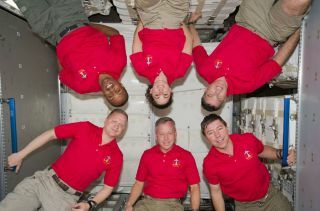 Lindsey and Kelly then shook hands, and the two crews shared some laughs as cosmonaut and station flight engineer Dmitry Kondratyev captured some last group pictures. Members of mission control at NASA's Johnson Space Center also expressed their thanks and gratitude to Discovery's crewmembers. "I did want to take the opportunity to say it's been an honor and privilege to work this mission with you," said space station lead flight director Royce Renfrew. "I feel really proud to take Discovery home at the very top of her game. A lot of credit goes to the onboard crew. You guys rock." On behalf of his fellow astronauts, Lindsey thanked the ground teams in return for their hard work. "We're really proud of you guys and the amount of teamwork it takes to pull this kind of mission off," Lindsey said. "It was an incredible effort on your part – you guys are really the unsung heroes in this. I would imagine these last couple of days were the two busiest days in the space station program. All your folks that have worked on this, on both programs, should be very proud." Renfrew wished the astronauts a safe journey back to Earth. "You guys have a safe trip home," Renfrew said. "We're looking forward to seeing all of y'all home on terra firma." The spaceflyers then exited the Destiny Laboratory to the station's Node 2, where Discovery's astronauts said their final goodbyes with handshakes and hugs, before traveling through the tunnel back onto their spaceship. This morning, flight controllers had some fun in their morning messages sent to the crewmembers, writing: "Just a friendly reminder – before closing the hatch tonight, make sure everything and everybody is on the correct side!" The forward hatch between Discovery and the space station was sealed at 4:11 p.m. EST (2111 GMT). The shuttle astronauts will spend the night sleeping onboard Discovery before undocking from the station tomorrow morning. Discovery is scheduled to land at NASA's Kennedy Space Center in Florida on Wednesday, March 9, at 11:58 a.m. EST (1658 GMT). Discovery's 13-day STS-133 mission is the last flight of the orbiter's career, after 39 trips into space, including 13 visits to the International Space Station. After this mission and 27 years of spaceflight, the shuttle Discovery will be retired from service, as NASA brings its space shuttle program to an end later this year. NASA has two final shuttle missions planned – Endeavour's STS-134 mission in April, and the final STS-135 flight of Atlantis in June.